Membership: Alexander Flynn (leader/founder), Axe, Horns (Jon Morse), the Howlers (Bouncer (Skottie Hightower), Barker (Terry Hightower) and Byter (Buford Hightower) ), Hugo Longride (leader/founder), Ivich Williamson, Lexi, Max Rocker, Ralph Novak, Shellbot, Shockman (Shawn Key), Snaketongue (Terra Poole), "Viperion," various unidentfied others, and support staff. Purpose: To provide live entertainment to the super-rich by fighting, sometimes to the death. History: The Gladiators were originally founded by Hugo Longride and Alexander Flynn several years ago to give the super-rich businesspeople and Hollywood celebrities a rare form of entertainment: watching freakish mutants battle each other live, sometimes to the death. They were later secretly trained, first by Alexander Flynn, then the Shadow King, to be a covert army to help conquer respectively Latveria and the world. All of the Gladiators have numerous scars and many have artificial limbs. All are expert fighters using swords and other bladed medieval-style weapons,. (Beauty and the Beast#2) The Gladiators Bouncer, Barker, and Byter accompanied Alexander Flynn when he arrived at the Heartbreak Hotel to bring the Dazzler back to fulfill her contracts with the Underground Theater. Later that night Dazzler debuted as a singing Gladiator, with Horns as her first opponent. 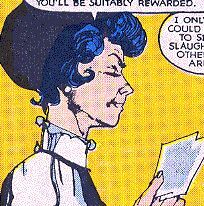 When Dazzler realized what she was really doing in the Arena she ran off the stage, forcing Longride to send all the Gladiators present that night to take the stage in a free-for-all. The fight ended when Horns "accidentally" killed his new opponent. (Beauty and the Beast#3) A week later some of the Gladiators were exercising in their gymnasium and witnessed with approval a practice bout between Dazzler and Horns. After the last of the Arena fights later that night the Gladiators were ordered by Longride to kill Dazzler after she refused to kill Beast during their fight, but when Flynn ordered the Gladiators to chose which of them (Flynn or Longride) they wanted to follow and kill the other, many of the Gladiators chose to kill Longride and follow Flynn. (Beauty and the Beast#4) That night two unidentified Gladiators accompanied Flynn and Rocker when Flynn went down to the dungeon to taunt Dazzler and Beast. Later that night two Gladiator guards stumbled across Link and Poltergeist when the kids snuck into the Underground Theater in an attempt to rescue Dazzler. When the guards tried to stop them Link quickly disabled and/or killed them. 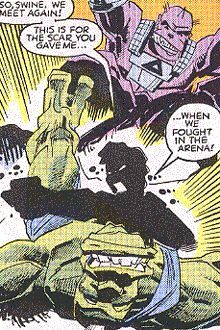 Meanwhile, the rest of the Gladiators were with Flynn in the Arena trying to kill Dazzler and the Beast before leaving to conquer Latveria, but were quickly defeated by the two heroes, plus Rocker, Link, and Poltergeist. When Flynn captured and attempted to kill Poltergeist, the rest of the Gladiators saw Flynn for what he was and abandoned Flynn's leadership in favor of Rocker's, who promised to start a new theater that didn't involve the Gladiators in fighting each other to the death every week. (New Mutants I#30 (fb) - BTS) - Amahl Farouk, in the body of Karma (Xi'an Coy Mahn), took control of Flynn and the Gladiators. 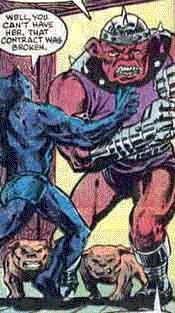 (Official Handbook of the Marvel Universe Deluxe Edition#17) - Farouk used holographic images of the Gladiators' former leader, Alexander Flynn, to convince all but his inner circle in the operation that Flynn was still in control of the Gladiators' activities. (New Mutants I#31 - BTS) - The Flynn that the New Mutants, Dazzler, and Kitty Pryde would encounter was never anything more than a holographic illusion, designed to hide the identity of the real puppet master (Amahl Farouk). (New Mutants I#28) - An unidentified representative of the Gladiators met with Empath (Manuel de la Rocha) at the New York City headquarters of the Hellfire Club where he (Empath) gave her the dossiers of Magma and Sunspot as potential combatants for the Gladiators. The representative agreed to pass Empath's proposition on to her employer and told him that he would be suitably rewarded if her employer accepted it. (New Mutants I#29 - BTS) - A group of the Gladiator's non-powered employees lured New Mutants Magma (Amara Aquilla), Sunspot, (Roberto DeCosta) Cannonball (Sam Guthrie), and Magik (Illyana Rasputin) to the West Salem high school under the pretense of a swim party with some local kids. When the kids got there the squad ambushed them and kidnapped Sunspot and Magma and escaped with them to the Westchester County Airport with Cannonball and Magik in hot pursuit. (New Mutants I#29) - One of the squad attempted to run down Cannonball with a truck but was stopped by him instead and taken prisoner by Magik. When Cannonball then tried to catch the plane his friends were on the pilot let him get close enough to the jets to get hit full force with the afterburners. While Cannonball was recovering from that, the rest of the squad escaped with their prisoners. Immediately afterwards Cannonball and Magik interrogated the truck driver in Limbo. The driver defiantly refused to tell them anything at first but then reconsidered when he realized that his interrogation was to be at the hands of Magik's pet demon S'ym. A few days later Axe had a brief fight with Sunspot in his cell at the Arena to demonstrate the latter's powers for Alexander Flynn. He then witnessed the discussion between Sunspot and Magma about what would happen to some runaways if they refused to fight in the Gladiators for Flynn, and then watched as they agreed to stay. Later that night a disguised Dazzler interrupted a bout between Ivich and "Viperion" when it appeared that Ivich was going to lose. Immediately after the "save" the next bout began: Sunspot and Magma versus Axe, Max Rocker, and Ivich. 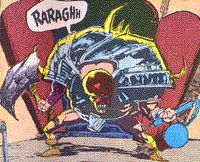 The fight was interrupted by Magneto when he arrived seeking the New Mutants as allies in the fight against the Beyonder. Sunspot and Magma chose to stay put rather than risk the lives of the runaways in the Arena. All of this was witnessed via hologram by the Shadow King-possessed Karma in another part of the Arena. (New Mutants I#30) - Two unidentified Gladiators were defeated in the Arena by Sunspot, to the cheers of the crowd. A few days later an undercover Dazzler overwhelmed and stunned a crowd of fighting Gladiators (including Sunspot) in unconsciousness. The next day the winged Gladiator Lexi saved Dazzler from a nasty fall after Magma tried to fry her and Sunspot threw her into the air in an attempt to give her a fright. A few nights later the disguised Shadow King arranged a bout to the death between teammates Sunspot and Magma against a gigantic Gladiator. Unknown to the two New Mutants, their opponent was Shadowcat, who had been discovered and enslaved by the Shadow King earlier that night and forced to power the giant robot facing them. (New Mutants I#31) - After a brief battle Shadowcat was able to shake off the Shadowking's control and escape the robot. The Shadow King then possessed Dazzler and used her powers to fight the three mutants until Cannonball arrived with Rachel Summers and Magik in tow. Magik teleported Dazzler into Limbo, which caused Ivich and the other Gladiators to attack them. The battle lasted until the Gladiators were defeated and the police showed up to investigate the commotion The New Mutants then left to follow the disguised Shadow King to his getaway jet. 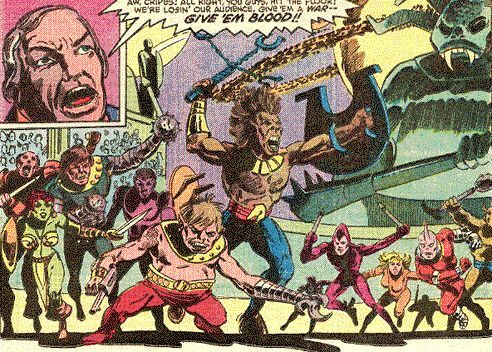 (New Mutants I#32 - BTS) - The Shadow King-possessed Karma hired some of the Gladiators as guards in his/her mountaintop villa in Madripoor. (New Mutants I#32) - The Gladiators fought the full New Mutant group when they launched a night attack against the possessed Karma in her Madripoor villa. After the Shadow King used Karma's powers to take control of the Mutants (with the exception of Mirage, Magik, and Warlock) he then tested his control of them by making the kids use their powers to kill the Gladiators. Comments: Created by Ann Nocenti, Don Perlin, and Kim DeMulder. "Viperion", Lexi, various others created by Chris Claremont and Bill Sienkiewicz. Alexander Flynn, Ivich, Hugo Longride, and Max Rocker all have their own entries on the Appendix. While I am putting the Shadow King's takeover of the Gladiators immediately after the events of B&B #4 a case can be made that the takeover actually started well before that with Farouk gradually seducing Flynn into actively making plans to overthrow his natural father and killing off his chief rival for leadership of the Gladiators, Hugo Longride. A further discussion of this is in the comments to Alexander Flynn's entry. For a bunch of people who are used to killing each other in bloody combat, it was very odd that none of the Gladiators noticed that Longride didn't bleed at all when they stabbed him to death. Maybe the Shadow King was using his powers to blind them to that small fact? None of the Gladiators shown here, except the quartet noted below, became the Shadow Kings employees in Madripoor and thus were not killed by him in NM I#32. New Mutants I#29 & #30 are part of the Secret Wars II crossover that ran in almost all of the main Marvel titles in the summer of 1985. SWII#1 takes place between the two New Mutant issues. Which explains why Magneto showed up when he did. The Gladiators have a full entry in Marvel Legacy: The 1980s Handbook. Most full names were revealed in the Gladiators' entry in OHOTMU A-Z Hardcover#4. or to anyone or anything else with a similar name or powers. Anyone else's Support Staff, named or unidentified. Jon Morse was the Dazzler's first opponent in the Arena and quickly made it plain that he was determined to win their fight no matter what. 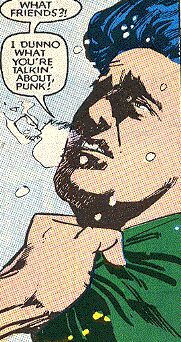 During the melee that followed Dazzler's abandonment of the fight Horns fought and killed anther Gladiator, an action he was punished for later that week by Flynn, Ivich, and Rocker. Later that night Horns was one of the Gladiators ordered by Longride to kill Dazzler when she refused to kill the Beast but instead was one of the ones who turned on Longride and killed him. The Hightower brothers were the Howlers -- Bouncer (Skottie), Barker (Terry) and Byter (Buford). The Howlers were observed creating a loud humming/growl-like sound that they used to confuse and disorient an opponent. It is unknown whether any of the three can use this power without the other two present, or even what the actual relationship is between all three (they do share a very strong resemblance to each other, stronger than coincidence should allow). The strength level of all three are unknown, though I suspect the bites of the two bulldogs are strong enough to keep any but the strongest from easily breaking free of them, while the big one is super-strong. They went up against the Beast when Flynn went to the Heartbreak Hotel to collect Dazzler but Beast quickly defeated Bouncer, and they left soon afterwards with Dazzler in tow. Several weeks later Bouncer was present in the Gladiators' gym when Magma and Sunspot tried to give Dazzler a fright by trying to fry her and throwing her into the air, where she was caught by Lexi. Nothing is known about this Gladiator beyond the fact that he looks kind of like a purple gargoyle, has wings, and three tails. He was the one who caught Dazzler when Sunspot threw her into the air in an attempt to give her a fright. A few nights later he was part of the gang of Gladiators who followed Ivich into the Arena when she thought Dazzler was killed by Magik. When the Shadow King took possession of Shadowcat he imprisoned her in this gigantic robot shell and forced her to fight her friends Magma and Sunspot to the death in the Arena. Before anyone could be killed Shadowcat shook off his influence and escaped the robot. Once she left it the robot fell powerless to the ground. Shawn Key was the guard who notified Hugo Longride of Beast's explorations of the Arena's back rooms. He has electrical powers that were used to shock Beast into submission long enough for Longride to inject him with a drug that would turn the Beast into a real, uhm, beast in the Arena. Terra Poole was the redheaded women who is seen in the lower right corner of the second Gladiator group picture. Nothing is known about her abilities except that she has a forked tongue (hence the name I gave her) that she can use in a manner similar to a frog's tongue, but with enough force behind it to break a two-inch piece of wood in half. 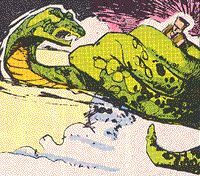 (Ray, last name unknown): Gladiator whose main mutant ability is to turn into a giant snake that's about the length of one town block, complete with a rattle on the end of his tail. He was Ivich's opponent in the Gladiator match that was witnessed by Lila Cheney, Dazzler, and New Mutants Cannonball and Magik. He was prevented by Dazzler from killing Ivich and then was saved by her when Ivich tried to kill him. While he has fangs it is unknown if he is venomous as well. However, since his main mode of attack in snake mode seems to be to use his body like a boa constrictor's and crush his foes to death he probably wouldn't use a venomous bite very often anyway. These are some of the guys who were a bit more than a face in the crowd but otherwise had little or did little to distinguish themselves from the pack. 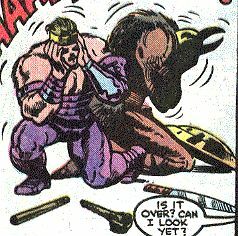 The two "human" Gladiators above who are bent over in pain are the two guards who were guarding the Arena the night when Flynn decided to kill Dazzler and Beast, but who were attacked by Link instead. While their final fate is unknown it is likely they are dead. 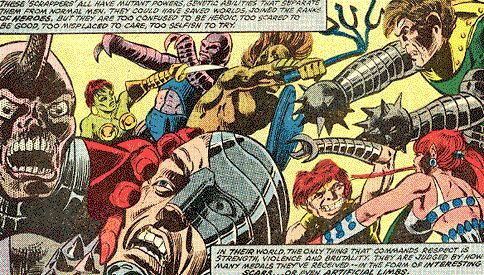 The guy with the half-metal face in the lower left corner of the second group shot (the one next to Horns), as near as I can tell, seems to be the guy who Horns killed in the Arena after Dazzler fled during her debut fight. These four Gladiators were the only ones shown who were hired as bodyguards by the Shadow King. Their ultimate fate was to be used as cannon fodder for the Shadow King-controlled New Mutants and killed. The Gladiator Sunspot claims gave him a scar in the Arena is not drawn the same way as the guy who the reader was shown to cut Sunspot back in #30 (the two he was up against there were drawn as brutish humans in that scene). Unless this guy was some type of shape-shifter then Sunspot had another arena bout with the green guy that the reader has not been shown, where he got another scar. These are the guys who were part of the Gladiators organization but who were part of the support staff rather than one of the combatants. This unidentified woman was the Gladiator procurer that Empath contacted in New York City. What her exact connection is to the Hellfire Club is unknown. She knew a great deal about Empath's recent history (specifically about his powers and their temporary removal by the White Queen Emma Frost until he could prove he would behave himself) that would not be general knowledge within the Club itself, not to mention to those outside of the Club. Presumably her unidentified employer is Alexander Flynn, since Farouk was using a female host body as that time and would surely have been referred to in the feminine if s/he was the rep's immediate boss. The guy on the left is the guy who was piloting the getaway jet for the Gladiator squad. He regretted having to get rid of Cannonball since his boss "could use power like that." 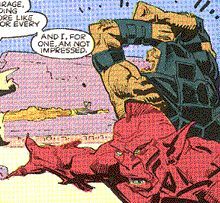 The guy on the right was the truck driver who tried to run Cannonball down and who talked in Magik's Limbo when he realized his interrogator was going to be the demon S'ym. It is unknown if he was released from Limbo before Magik had her "temper tantrum" at the start of NM I#30, or, if he wasn't, what his current condition is, assuming he is still alive after that "tantrum." 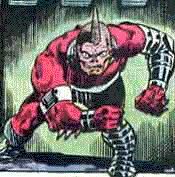 This guy was the bouncer at the Arena the first night the New Mutants tried to rescue their teammates. This picture doesn't show it that well, but he looked to be an age-indeterminate punker-type dude, complete with Mohawk.